The Powell Sonaré 705 Model is the premiere model of the Sonaré Range. With the most options and upgrade features, the 705 is perfect for the most discerning intermediate flutist. The instrument features a Sterling Silver body and headjoint, with a Nickel Silver, Silver Plated mechanism. 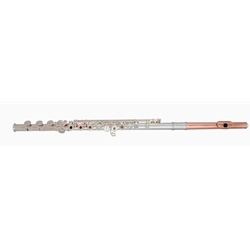 With French Pointed Arms, this model is available with Offset or In-line G Keys, B or C foot joints, Split-E mechanism or C# Trill (Offset flutes only). Customize the headjoint with an Aurumite 9K Lip Plate (K Style) or complete Aurumite 9K Tube and Lip Plate (KT Style). This model also features the feel of a professional flute with 10K White Gold Springs.